This is the first part in the series CI/CD on Kubernetes. In this part we will explore the use of Kubernetes Namespaces and the Kubernetes PodNodeSelector Admission Controller to segregate Jenkins agent workloads from the Jenkins server (or master) workloads - as well as other workloads on the Kubernetes cluster. As we continue on with the series we will see why this will serve as an important foundation for managing Kubernetes configuration for Jenkins agent related features such as autoscaling, resource quotas and security constraints. It is considered a best practice with Jenkins to have a distributed workload where the majority of your CI/CD workload is distributed across a pool of agents. Many CI/CD automation tools have a similar concept as Jenkins in distibuting much of the workload to agents running separately from the CI/CD server or master ; so this will most likely apply even if you aren’t using Jenkins for CI/CD. Of course it is also considered a best practice to have multiple Jenkins masters for a large organization, but having multiple Jenkins agents is absolutely critical to long-term successful CI/CD for organizations of any size. Whereas a Jenkins master is typically a long-lived and stateful application - a pet if you will, we want Jenkins agents that are dynamic and ephemeral - cattle. Kubernetes is a perfect platform to manage your herd of agents - specifically with the Jenkins Kubernetes plugin, so we will not only have a pool of agents, but we will have a dynamic pool where agents are created on-demand and destroyed after they are used. However, we also want to ensure that this dynamic agent workload does not negatively impact our Jenkins masters. We will accomplish that by segregating the two workloads. Kubernetes provides a number of capabilities that will allow us to achieve this segregation. Kubernetes provides Namespaces to allow the segregation of Kubernetes objects within the same cluster. Additionally, many Kubernetes solutions have a concept of node pools. A node pool is a group of Kubernetes nodes with the same characteristics - such as the same instance type. Kops refers to node pools as InstanceGroups and for AWS they are backed by AWS Autoscaling Groups (ASG) where all the nodes in an InstanceGroup would be of the same EC2 instance type in addition to other defined characteristics. Kops provides the ability to create as many node pools (or InstanceGroups) as makes sense for your cluster - as does the Google Kubernetes Engine (GKE). 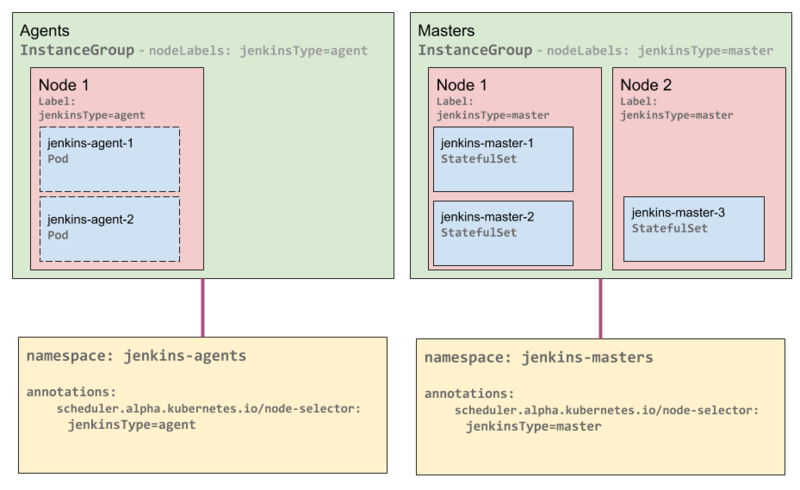 To achieve the segregation between Jenkins masters and agents, we are going to create separate Namespaces and node pools that are individually specific to Jenkins masters and agents. This will result in all Jenkins agent Pods being on agent dedicated nodes and being isolated from nodes with Jenkins masters or other workloads on your Kubernetes cluster. NOTE: As of the date of this post, the Azure Kubernetes Service (AKS) does not support multiple node pools - per this GitHub issue it is on their roadmap. If you already have a configuration entry for the kubeAPIServer then just add PodNodeSelector to the end of the admissionControl list. Once you have saved the changes you will need to update your cluster - for kops: kops update cluster --yes. If this is an existing cluster then you will also have to perform a rolling-update: kops rolling-update cluster --yes. NOTE: If you are enabling additional admission controllers on a new cluster you should do it before you apply the configuration or a rolling-update of all of your cluster nodes will be required. So now that we have the PodNodeSelector admission controller enabled we can create the node pools and namespaces. We will create two node pools - one for Jenkins masters and one for Jenkins agents. And because we are using kops InstanceGroups - any time we add additional nodes to either node pool it will automatically have the jenkinsType node label applied. Next we will create two namespaces. Again, one for Jenkins masters and one for Jenkins agents. The scheduler.alpha.kubernetes.io/node-selector annotation is used by the PodNodeSelector admission controller to assign default NodeSelectors based on the namespaces where a pod is created. This results in all pods being created in the jenkins-agents namespace landing on nodes in the jenkins-agents node pool and being segregated from Jenkins masters. NOTE: The PodNodeSelector also has a file based configuration that allows you to not only specficy default NodeSelector labels for specific namespaces but also allows specifying a clusterDefaultNodeSelector. However, I have not yet figured out how to use this file based configuration with kops - so if you have any ideas on this, please comment below. There is a GitHub issue tracking this. So now that we have node pools and namespaces for our Jenkins masters and agents we need to configure the Kubernetes plugin to use the jenkins-agents namespace. To start with, we must create a ServiceAccount in the jenkins-masters namespace as the requests for new dyanmic agent pods will be initiated by our Jenkins master running in the same Kubernetes cluster. For clarity, I will specify the namespace in the configuration and will use the ServiceAccount name jenkins. Now we need to create a Kubernetes role to allow the jenkins ServiceAccount to create, use and delete pods, excute commands in pods and access pod logs in the jenkins-agents namespace based on the example provided in the Jenkins Kubernetes project. The primary difference between the example provided in the link above and the above configuration is the use of the namespace for the RoleBinding subjects. Now you can use the ServiceAccount and jenkins-agents namespace we created with these instructions to configure the Kubernetes plugin for your Jenkins master and be assured that your distributed Jenkins agents will not negatively impact your Jenkins masters or any other workload you have running on your Kubernetes cluster. In the next post of the series CI/CD on Kubernetes we will explore autoscaling for the Jenkins agent workload.